My Mom Fried The Best Fried Chicken.. always prepared her chickens the day before and cooked them simply. In a large resealable plastic bag, combine first four ingredients. With paper towels, pat chicken dry; add to bag, a few pieces at a time. Seal bag and shake to coat. In a large skillet over medium-high heat, heat 1/2 in. 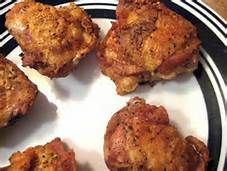 of oil; fry chicken until browned on all sides. Reduce heat; cover and cook for 30-35 minutes or until juices run clear, turning occasionally. Uncover and cook 5 minutes longer. Drain on paper towels.